Unlike the desktop browsers, there are no obvious “History” menus in Safari on the iPhone, iPod touch, or iPad to help you navigate through webpages you visited earlier that you may want to access again. But that doesn’t mean there is no browsing history feature, instead it’s just slightly hidden, and accessing the browsing history in Safari is super simple though it may not be immediately evident given how it’s accessed in iOS. It’s generally easiest to view the Safari History in landscape mode on the smaller screened iPhone and iPod touch displays since you’re able to see more of the page titles and URL’s, though it’s still visible in vertical portrait orientation as well. Everything from a single browser window will be stored in History unless that window has been closed, but even still some of that information can be recovered if someone was persistent enough. If you are looking to prevent Safari from keeping track of web browsing history, the easiest way to do that is to simply turn on Private Browsing in iOS, a feature readily available on the iPhone and iPad, which will prevent any history from being stored. It’s quite obvious when it’s turned on because the Safari web browser turns black, signifying Private Browsing is enabled. On the other hand, if you forgot to enable the private browsing feature and now have a bunch of web history you’d rather not be viewed, recovered, or found by others, you can always choose to manually clear out the browser history and caches instead by going to Settings > Safari > Clear History. It’s also possible to click on the bookmark icon, click back out of the bookmarks, and view all the browsing history available, not just the last few clicks that are easily available. I tend to close my tabs a lot to keep a clean page for the next use, so the page’s tip is of less use to me. I like this one, excellent idea. 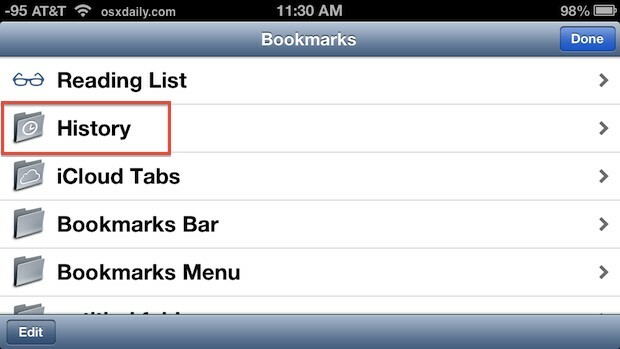 By pressing the bookmarks icon there is a History log. It’s just another way to access the browsing history for the most recent sites visited, but you mention a great tip too so we will add it! I have a baby-sitter who I think may be watching inappropriate materials. I just don’t know how to check what he is visiting . He is only fourteen years old. I have an iPad. I tried the suggestion about the bookmarks but I didn’t do it right. Can u help me through the process? In Safari, tap and hold on the “<" Back button to see if sites come up, it's a button but it looks like an arrow pointing the other direction. If the iPad user is a 14 year old of the male variety, it's practically guaranteed they are doing something inappropriate with the iPad, but they could be clearing the history and cache too. 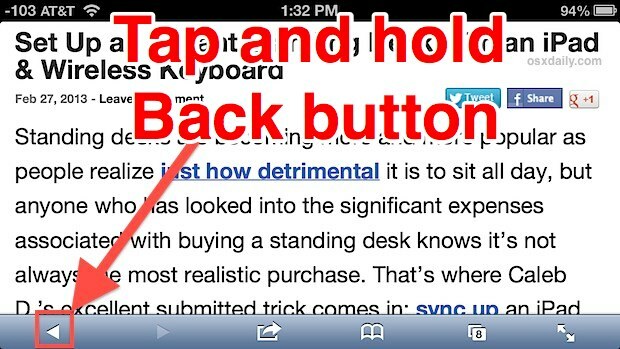 Will history that was viewed in private browsing mode show too when pressing this arrow! Sorry. That was suppose to be a question mark. Also, if my ipad shows my email acct and texts from my iPhone is there a way to view private browsing history from the iPhone, on the iPad? No, the whole point of Private Browsing is that there is no history maintained or stored, thus there is no way to view the private browsing history. But the private browsing info is stored some where out there….. Where? No, private browsing data is not stored anywhere that an average user is going to access under any reasonable circumstance. That is why it’s called Private Browsing, so no caches are kept locally. 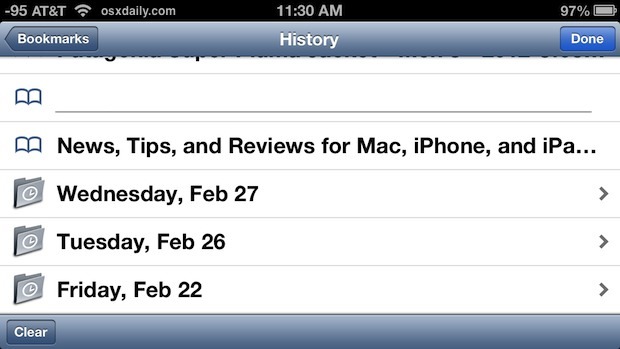 On our iphone, it’s easy to go to settings>Safari>Advanced>Website Data and find websites that have been visited on the iphone but how do I find the date & time they were visited? Or is it even possible? I have perused 100 forums & can’t find the answer. Same question here. Did you find the answer? I have two iPhones with same Apple ID same iCloud and I want it that way my safaris are synced — if I have one iPhone can I check the history of the other iPhone from the one I’m using? I don’t get any tabs when bookmark icon is tapped. Only bookmarks.. Is this article outdated or my iPad safari out dated? Hi, looking at the history, is there any way of checking the exact time that the browsing happened? I can see that you can check the day, but there doesn’t seem to be a time shown anywhere. Thanks. My son has an older iPod but has the ios6 software – is there a way to see an exhaustive web history from more than 10 days ago? I went to settings and advanced history but it doesn’t show dates. I would also like to see what was viewed prior to the 10 days ago time frame – for some reason, nothing is before 10/28 but he has had his iPod much longer than that. I am trying to determine when he began viewing certain sites. thanks for any help. I hate the idea someone going into my business! 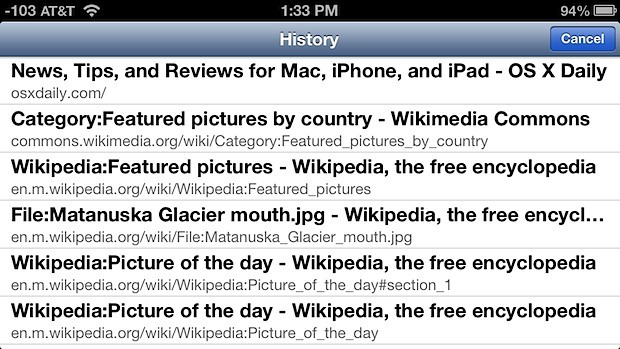 Is there a way to check the history from an iPhone on a iPad? How can i figure out which device was used to visit a site from the safari history page ? Does anyone know how long safari history is stored for on an iOS 9 iPhone? There appears to be approximately a one month limit but I am uncertain.